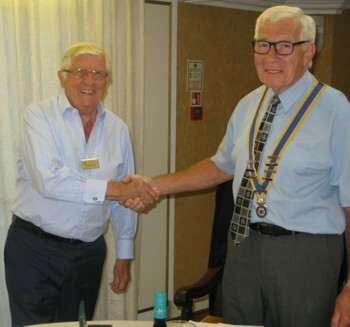 Former accountant Brian Arendell has become the new President of the Rotary Club of Cranleigh for the coming year, taking over from David Hall at a meeting of the Club on 28 June. Unfortunately, David was not well enough to attend, so Past President Patrick Leake took his place and welcomed Brian to his new post. All those present wished David a speedy recovery. Brian and his wife, Pauline, have lived in Cranleigh for well over 40 years. Brian formerly worked in Godalming and Horsham, and was a School Manager at the University of Surrey in Guildford before he retired. Brian first became President of Cranleigh Rotary in 2005. In his second spell as President, Brian is keen to further increase the number of members, associate members and "friends" of the Club. If you would like to know more about Cranleigh Rotary, Brian's contact details are given on the front page of this website. Photo caption: Incoming Club President Brian Arendell (right) is congratulated by former President Patrick Leake.